A large private, luxury Spanish Colonial style Villa situated a 5 minute stroll from the white sands of Plettenberg Bay's main Hobie, Central and Beacon Isle beaches. Walk 200m up to Plettenberg Bay's main restaurant and shopping area. This Dream Villa is a large property with a lush high walled garden that has electronic gates, situated in a quiet cul de sac. 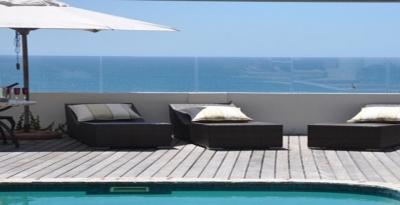 Enjoy the spectacular views of Plettenberg Bay's famous beaches, lagoon and distant mountain ranges from the luxury of private bedroom balconies. Watch the whales and dolphins frolic as you relax next to the sparkling pool on the wooden deck. We are 300 m stroll down onto Hobie Beach and Central Beach, as well only 10 minutes to Beachyhead. An entertainer's dream, a glass doors folds back to extend the 10 seat dining room onto the mid- balcony where you can take in the breathtaking panoramic views. The dining room has a large wood burning fireplace for winter. There is another 10 seat travertine table on this balcony as well as easy chairs for you to enjoy sundowner drinks. You may wish to serve pizzas from the pizza oven or have a braai. The outdoor granite bar comes complete with under counter stainless steel fridges. From this level you can walk across the bridge that spans the swimming pool and relax on the sun loungers. The living room is large by any standards with a wall mounted flat plasma screen television, PVR and entertainment system. A large gas fireplace adds to the ambiance of this Spanish room with its gorgeous comfortable sofas. There is a downstairs games room with a snooker table, T.V and beechwood pub. There are 5 large designer decorated bedrooms. Three have king-size beds and are en suite. Each bedroom has a balcony. Two have twin single beds and share a full bathroom opposite. There are heated towel rails for your comfort. The master suite has a large travertine bathroom with a huge double shower and a free standing bath that discreetly overlooks the crashing waves below. There are wooden colonial paddle fans and under floor heating in the bedrooms and living room. A large modern walk- in kitchen is well appointed with stainless steel appliances and has granite surfaces. There is a fully equipped laundry area. Our housekeeper Joanna services the Villa daily (except Sundays) and she has her own accommodation on the property. She can stay in for babysitting and is excellent with children. There will be sparkling wine on ice upon your arrival.